Meet the ultimate insider. Soon, every American will know his name. In Part One, I detailed how the United Nations is posturing to seize American guns as a prelude to martial law. If you have not read Part One, it will be helpful to do so before reading the rest of this article. Any police detective will tell you that it is sometimes necessary to look at the facts of an old crime in order to solve a new crime. If one wants to understand the forces at work which are posturing to enslave America, one has to first take a summary look at the forces behind the so-called Gulf Oil Spill because many of the players, one in particular, will prominently figure in what is coming. Before we can solve the soon-to-be-crime in which the UN completes its pre-positioning of its assets and moves to seize American guns and impose martial law under the umbrella of a completely manufactured crisis, we need to take a retrospective peek at what happened in the Gulf Oil Spill. 1. British Petroleum was the owner of the oil being removed from the floor of the Gulf. BP CEO Tony Hayward sold 40% of his BP holdings in the weeks prior to the spill and paid off his mortgage on his estate in Kent, England, avoided staggering losses. And true to form involving the pattern of perpetuating a false flag event with media complicity, on June 8, 2010, less than six weeks following the oil spill, BP bought Google and Yahoo Search Terms, related to the oil spill, in an obvious attempt to conceal as much of the truth as possible from the public. 2. Halliburton was drilling at the base of the Deepwater Horizon. Very coincidentally, only 11 days before, on April 9, 2010, Halliburton purchased Boots and Coots for a quarter of a billion dollars. Just who is Boots and Coots? Coincidentally, they are the largest oil clean up firm in the world And when the explosion took place 11 days later, wasn’t it fortunate that Halliburton was there armed with Boots and Coots as they capitalized on their timely good fortune. Subsequently, Halliburton’s profits increased 83% in just 3 months following the Gulf Oil Crisis subsequent to the clean-up efforts. It was simply raining coincidences! Oh, and the President got his hands dirty as well. The late Bob Chapman, while appearing on the Alex Jones Show in June of 2010, revealed that Obama’s only asset holder, Vanguard I and Vanguard II, dramatically sold off BP stock only few weeks before Gulf oil explosion. Chapman also revealed that “According to this FSB report the largest seller of BP stock in the weeks before this disaster occurred was the American investment company known as Vanguard who through two of their financial arms (Vanguard Windsor II Investor and Vanguard Windsor I Investor) unloaded over 1.5 million shares of BP stock saving their investors hundreds of millions of dollars, chief among them was President Obama. The FSB further estimates in this report that through Obama’s three accounts in the Vanguard 500 Index Fund he stands to make another $100 million over the next 10 years as their largest stock holding is in the energy giant Exxon Mobil which they believe will eventually acquire BP and all of their assets for what will be essentially a “rock bottom” price and which very predictably BP has hired Goldman Sachs to advise them on.” Watch the entire interview below. The top five dumping institutions of BP stock just prior to the spill included Goldman Sachs Asset Management, L.P. (-4,680,822), Wachovia Bank National Association(-2,667,419) and it is important to note that Wachovia is a subsidiary of Goldman Sachs, thus, making this one tight little family of co-conspirators. We also see massive dumping of Sanders Capital, LLC (-1,371,785) and PNC Bank, National Association (-1,177,413) brings noted globalist George Soros into the conspiracy as well. And we now know who orchestrated the entire event. Many have asked if there was a central figure who coordinated this conspiracy. If I were an unencumbered investigator and not operating under the umbrella of an agenda, I would want to look closely at a globalist named Peter Sutherland as the possible mastermind. But you see, Sutherland is not just the architect of the Gulf Oil Spill, as you will soon note, he will be behind what is coming with the United Nations take down of the United States. More to the point, from 1996-2009, Sutherland was the CEO of BP. In 2009, he resigned from BP and assumed a “non-executive” CEO position with Goldman Sachs, less than a year before the Gulf Event. Sutherland was in position to know how to manipulate this event and further, he would have been the one at Goldman Sachs who was in charge of the dumping of BP assets prior to explosion and to have orchestrated the cover-ups of Transocean and Halliburton. Where was the FBI and the SEC through all of this? 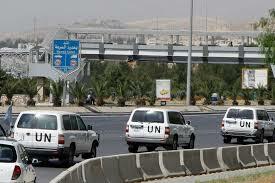 The UN’s International Migration and Development would be in charge of large scale population movements. 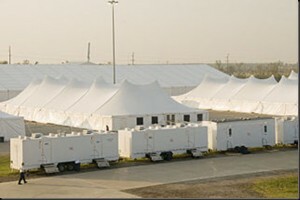 At one time, I believed that the Gulf was going to be evacuated and that Sutherland, who helped his corporate cronies profit from the event, would be in charge of the UN mandated evacuation of the Gulf. That still might happen, especially considering that Jesse Ventura discovered an Army Corps of Engineers document granting the Corps $40 billion dollars to evacuate the Gulf. However, today, there is a much more pressing issue. I was correct when I stated that Sutherland is going to be in charge of a major UN population movement inside the United States, but it is going to be triggered by an influx of millions of illegal aliens who will unwittingly create a monumental catastrophe on our border with Mexico and that crisis is already underway. On June 19, 2014, I wrote a story which detailed how America’s southwestern border is being overrun by illegal aliens, mostly children. Why just the children? That same day on my website, I published an article which contained an advertisement by the US government for escorts to help illegal immigrant children who were going to be illegally crossing the border. In other words, this immigration crisis was planned at least 7 months in advance by the United States government. The national mainstream media is not yet covering the growing holocaust on our border with Mexico to the degree that it needs to be. 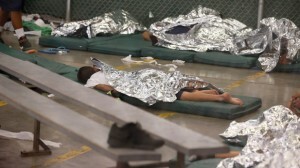 People are soon going to be starving, dying of thirst from crossing the border in very hot 110+ temperatures and some of these immigrants are bringing diseases into the US because of the extremely unsanitary conditions on the border. The local media in Arizona is covering this horrific event, but not the national media. 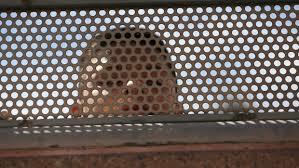 Below is a picture of illegal immigrant children being held in very primitive conditions in Nogales, Arizona. A holocaust in the making which will require the intervention of the UN Migrant Council headed by Peter Sutherland. Make this picture go viral. You know this is being orchestrated into a Hegelian Dialectic on the border. The children of Central America did not wake up this June and decide to hold their collective recesses on the border with the United States. They were encouraged and provided transport (see Part One). What Ties This All Together? 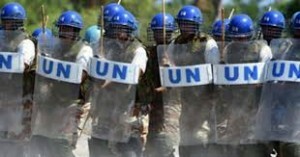 Question: When will the UN be called into play and take command of the “international crisis on the American border? Answer: When helpless children begin to die in the hot Arizona summer and America’s compassion for children, regardless of where they come from, is put into play. This will get the UN “relief workers” to be initially accepted. Watch the news events in the coming days and weeks. Soon, every news item on this event will accentuate the suffering that these poor children are going through as they are herded into America without any adult supervision. And yes, God does command us to help these innocent ones. 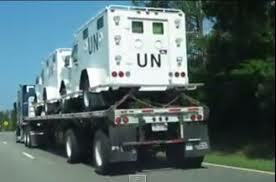 However, this will be the excuse that is needed to roll out these prepositioned UN assets. 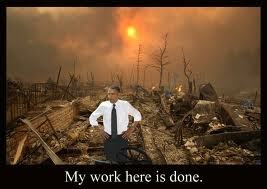 The immigration/border crisis is at least one part of the plot to subjugate America. And when it comes to relocating the soon-to-be millions of children flooding here to safe havens, who will be in charge? It will be Peter Sutherland and the UN Migration Council. And once the UN troops are openly on our streets, the foothold will have been achieved. Gun confiscation and martial law will be a foregone conclusion as the next, yet undefined, false flag event will unfold. When you see the blue helmets on your streets, it will be Peter Sutherland in charge. And I am certain that he will handle this crisis with the same demeanor and integrity as he handled the Gulf crisis. Meet your soon-to-be new United Nations Governor. He orchestrated the Gulf crisis and now he will be “managing” the border crisis. “As President, I want to encourage all Americans to welcome with open arms, the Peacekeepers from the United Nations as they help us mitigate the crisis at the border. God Bless America”! 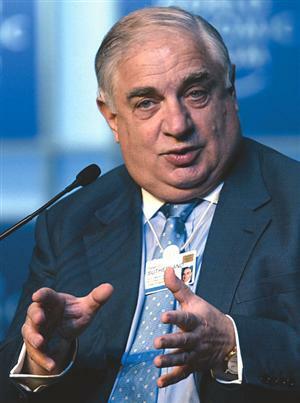 Take a look at Peter Sutherland, below, as he was video taped at Bilderberg this month. You can often tell a lot about the way a man carries himself.